The upcoming Surface Water and Ocean Topography (SWOT) mission aims to map the world's freshwater resources using Ka-band interferometric radar. In anticipation of the SWOT mission, an airborne calibration/validation system, AirSWOT, has been developed to generate SWOT-like measurements of oceanic and surface waters. AirSWOT's payload includes the Ka-band SWOT Phenomenology Airborne Radar (KaSPAR) and an NIR camera for land-water delineation. 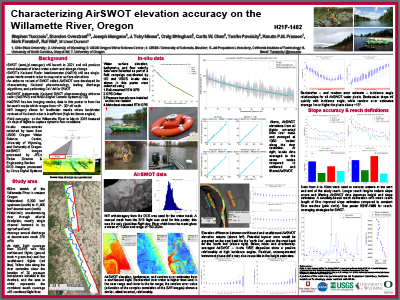 Here, we show AirSWOT data from March 2015 on a 75km stretch of the Willamette River in Western Oregon. KaSPAR measurements of water surface elevation, coherence, and backscatter, as well as NIR imagery, are examined in conjunction with in-situ water surface elevation measurements collected using GPS drifters, pressure transducers, and a motorboat-mounted RTK-GPS. We characterize KaSPAR backscatter and coherence characteristics over land and water as a function of incidence angle, and compare AirSWOT and in-situ measurements of water surface elevation and reach-averaged slope to assess AirSWOT's accuracy over the study area.